🚀 Summer Season Sale is Live! Learning AngularJS can be a real challenge because it involves understanding many concepts and requires a hands-on grasp of these concepts.The current course will give you a head-start in the right direction for learning AngularJS. In this course, you will be creating your own basic Hangman Game App which you can also play with your friends. By building Hangman Game App we will also show you how the requirements are mapped into small sprints and how as a developer you can do unit testing and integration testing. In a nutshell, this short course is designed to give you a quick glimpse of development process involved in the project involving AngularJS or similar front end technologies. Check the Live Running App Here! If you want to Learn More In-Depth of AngularJS. You can check out our "Learn and Understand AngularJS" Course. 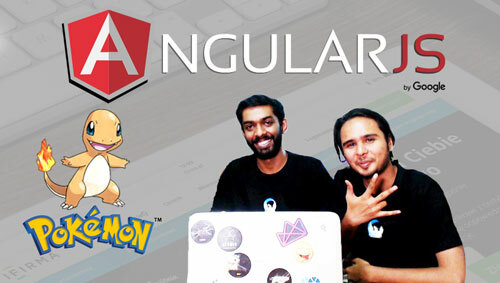 Where you can Learn AngularJS deeper by creating a Pokemon App that you can Play with your Friends. Ajay Nayak is Lead Instructor and Co-Founder of UI5CN and has more than 8 years of experience with online video-based learning. Previously he has worked with some of the reputed names like SAP®, Capgemini®, Skybuffer and Statoil® as a developer, consultant, architect and Subject matter experts respectively. According to him, learning should be interactive and engaging. And keeping an element of fun in it, can make even difficult concept simple to understand. Why should I get enrolled in the course? UI5CN courses are created by world class instructors and subject matter experts(SME). Normally, paid courses are more than 7 hours long with a deep dive into technology while covering full-fledged project(s). UI5CN content design and user experience team keeps a check thus ensuring world class contents. The content is designed such that students are able to work on technologies after having a hands-on exposure to them and aquire professional techniques after completing the courses. Respective UI5CN instructors also help users with any question or doubt regarding the course or coding exercise. In-case user still feels that UI5CN team could have done a better job, there is a policy of refund within 30 days of purchase. How does UI5CN provide assurance that I will learn the technology and be able to work on it? UI5CN team is committed not just to scale on breadth of technology but also the depth of it. All the course topics present on UI5CN platform are detailed and covers the technology hands-on with projects, example snippets and detailed practical examples. Why to go for UI5CN courses when I can get plenty of other courses on the same topic which might be cheaper or free as well? UI5CN focuses on packaging the bundles and courses with current and future market needs. Specific bundles and courses are well planned and topicwise content are covered keeping in mind students' job needs thus making them capable of taking on any challenge that they encounter in any project while working with respective technologies. Instructors of UI5CN course are Subject Matter Experts(SME’s) and they cover each topic in details, not just skimming the surface. UI5CN has courses on bleeding edge technology and UI5CN is not a course creating company but a R&D facility, which makes the courses much more detailed giving an edge to students' over other courses. Will I be certified after completing the course? Yes, once a user completes all the video content, text content and multiple choice questions in the course, they will be getting a UI5CN course completion certificate which can be shared in LinkedIn, job portals and extracted as PDF as well. The certificate has a unique id which can be verified through UI5CN platform as well. Will UI5CN Instructor help me if I come across some questions while learning the topic? UI5CN team is dedicated for the purpose of making learning happen. Respective SME will take care of all queries and question that are brought into platform and good questions are also showcased in weekly live webinars with details. Can I download the video and watch it offline? Offline features of UI5CN Course and Bundles will be rolled out soon which will allow students to take video content offline and watch them without the need of internet. What is the duration of completion of the courses? This courses will take you 1.0 hr to watch completely and since exercises are also involved, you might take slightly longer to complete the course. But if you have already had experience with the basics, then you can complete this course in relatively lesser time than specified. This course is great and I can definitely recommend it! Great course, excellent instructor, very good course content. Awesome as Always! He is very careful with his resources and the way he teaches. This small clash course is pretty objective and helpful. Good ordering, very very clear. Fantastic course.Got a good idea about AngularJS and how to build an app with Angular JS.